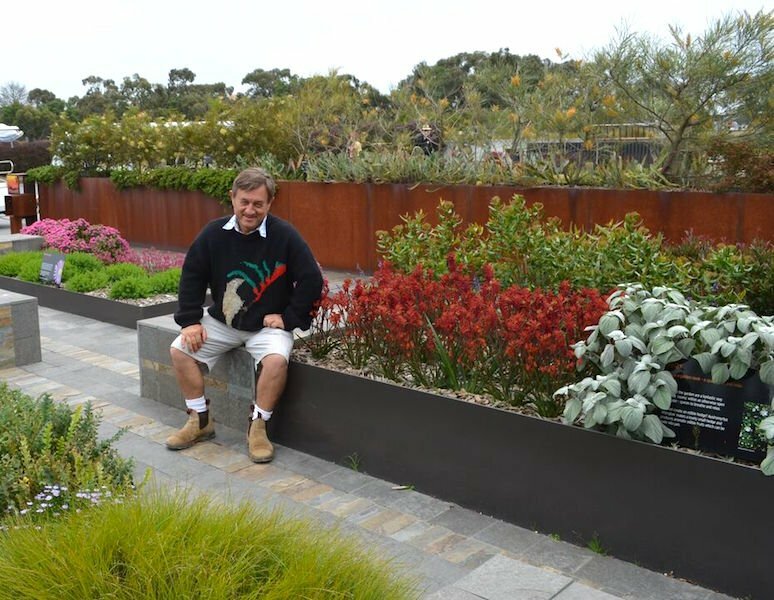 After 35 years breeding and growing kangaroo paws I was delighted to be invited by Rodger Elliot on behalf of the Friends of the Royal Botanic Gardens Cranbourne to help plan and be involved with a unique event titled the Kangaroo Paw Celebration. 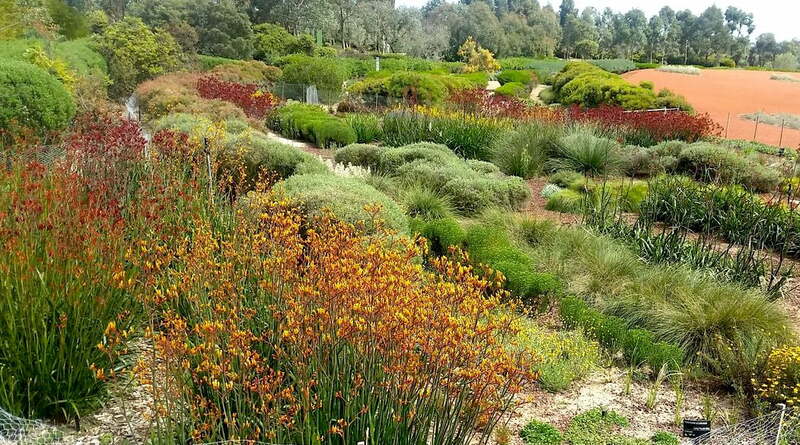 The event is a month-long exploration of the Kangaroo Paw family, Haemodoraceae that also includes the cottonheads (Conostylis species) and blood roots (Haemodorum species) amongst others. The idea grew out of discussions between Rodger and me for an event that would celebrate and educate the public about this remarkable plant family and its very distinctive Australian representatives. 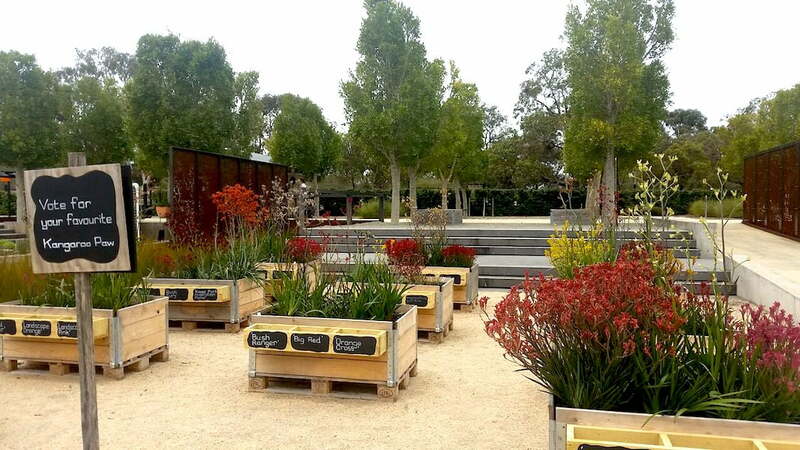 It would give the Cranbourne Gardens an opportunity to showcase the incredible colour and texture of the kangaroo paws and close relatives on the wonderful stage that the Cranbourne Gardens have created for Australian plants generally. Cranbourne Gardens is bursting with colour in November as the Australian Garden has many species in flower at this time anyway, but it is currently being transformed by bold and beautiful displays of the distinctively Australian kangaroo paw as well. 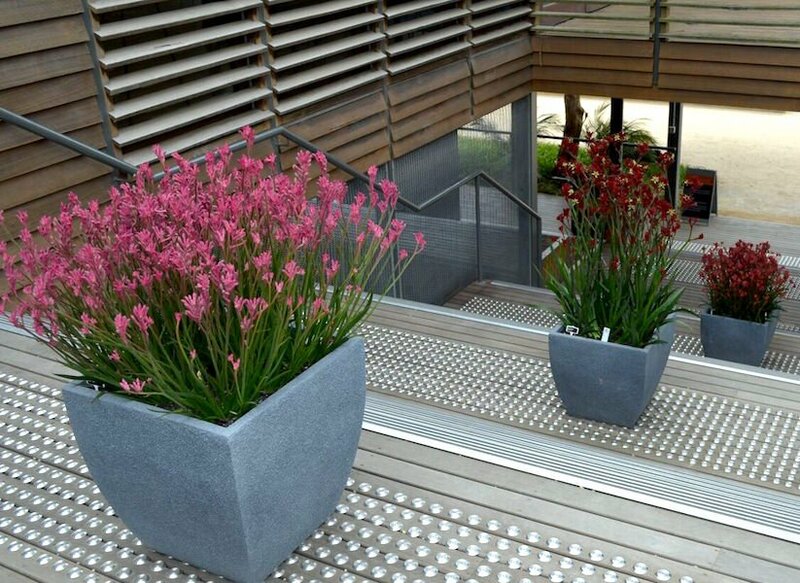 Container plantings in particular are demonstrating to the gardening public that there are many creative ways in which these distinctive plants can be used. 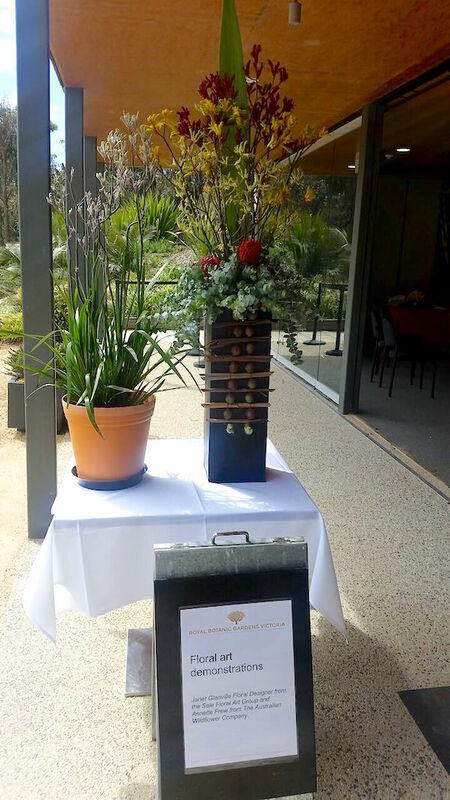 The inaugural Kangaroo Paw Picnic and Plant Sale was held on the weekend of Saturday 19 and Sunday 20 November. And for Kangaroo Paw enthusiasts, a three-day symposium – ‘Kangaroo Paws, Bloodroots, Cottonheads and More – a Symposium on the Family Haemodoraceae’ – is on from 24 to 26 November. A feature of the event that has been particularly exciting for me was the launch of my newest kangaroo paw Anigozanthos ‘Landscape Violet’. As well as its subtle smokey-purple flower colour, it is also one of the best growers I have ever released. 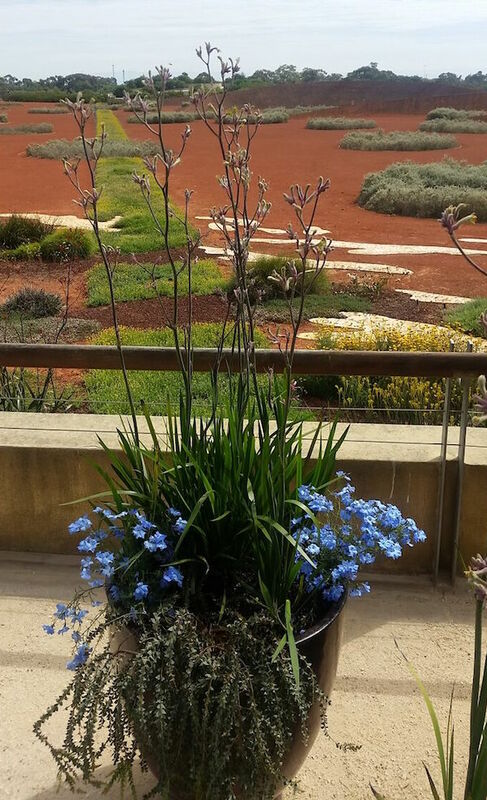 It has strong, vigorous foliage that is possibly the cleanest of any kangaroo paw cultivar as it is not subject to the same degree of foliage blackening by fungal leaf spots, and also the other environmental stresses that cause leaf blackening such as frost or snail damage. 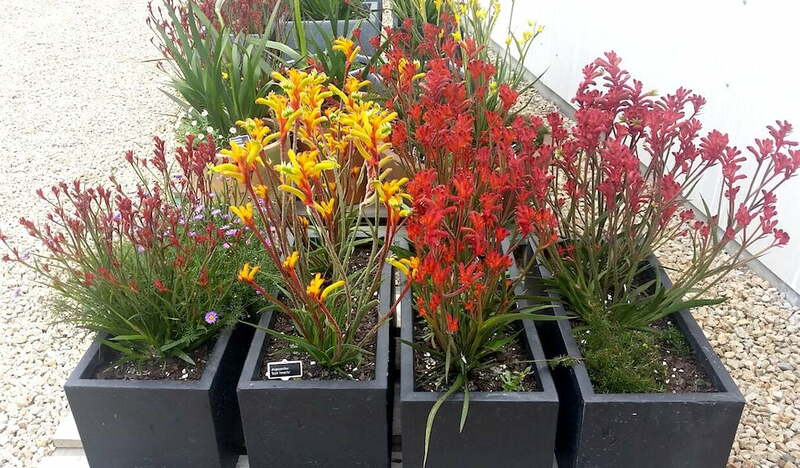 There are extensive plantings of dozens of different cultivars of kangaroo paw throughout the Australian Garden at Cranbourne, giving visitors an opportunity to see the range of colours and heights that are available commercially. 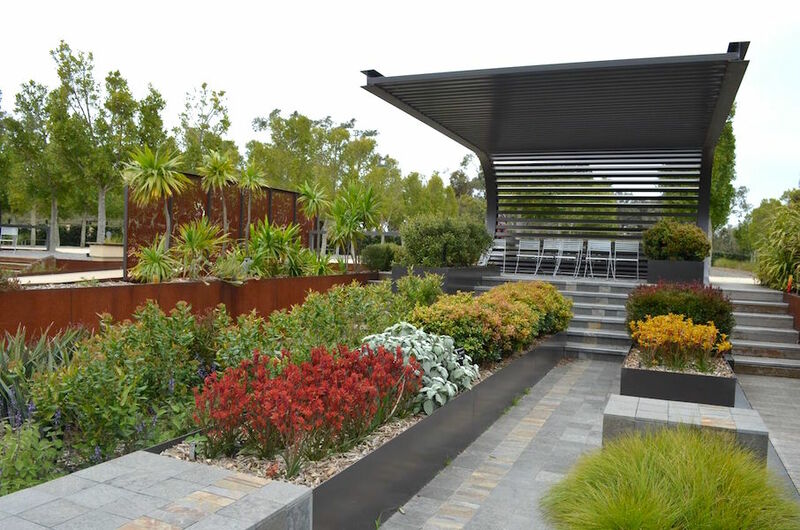 One of the most eye catching displays is in the ‘Lifestyle Garden’ area, where Australian plants are featured in a series of contemporary garden designs. 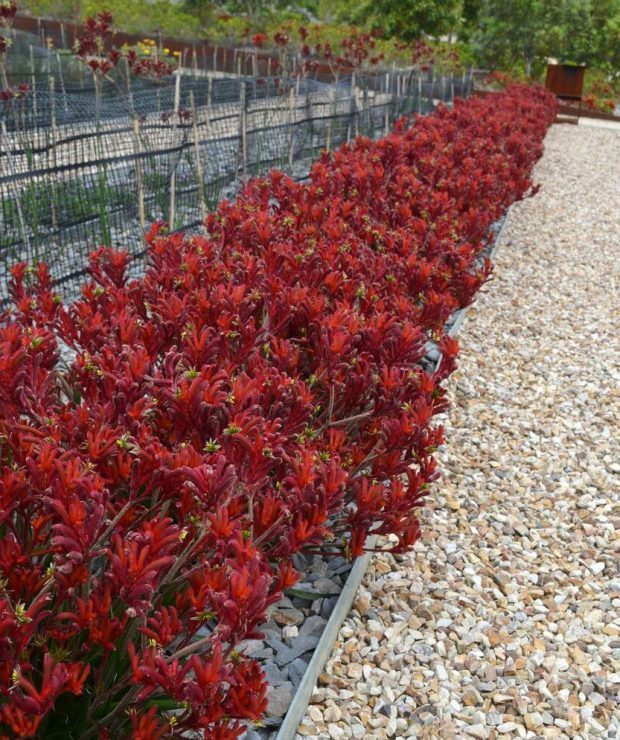 It is in this garden that several dwarf kangaroo paw cultivars have been used in raised beds, to stunning effect. On the boardwalk below this garden along a lakeside there is a series of planter boxes with alternate plantings of the two orange cultivars Anigozanthos ‘Bush Volcano’ and Anigozanthos ‘Bush Blitz’ that both show the potential of dwarf kangaroo paws as bedding plants. 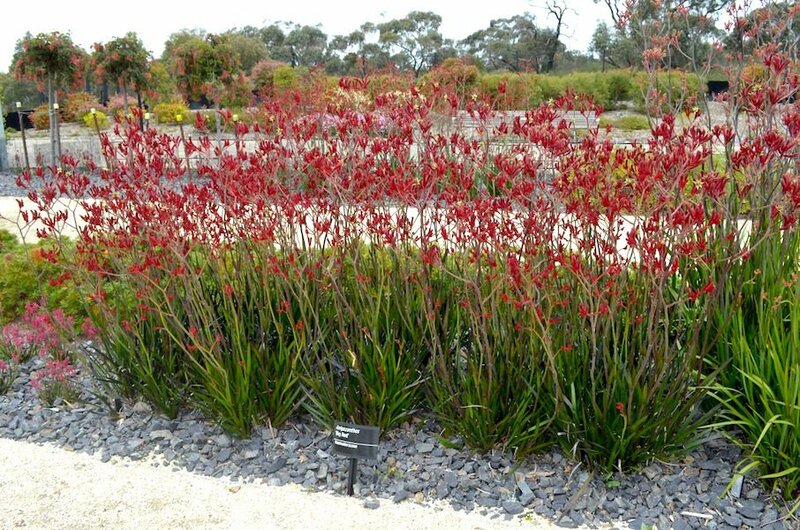 Many gardeners on the Australian east coast find the dwarf kangaroo paw cultivars difficult to grow, due to their susceptibility to various fungal root, crown and leaf diseases. The good news for east coast gardeners is that the tall cultivars of kangaroo paw such as my recently released ‘Tall and Tough’ Landscape series can be planted across a wide range of soil and climate types from Queensland to Tasmania with confidence. These cultivars can be seen across a range of garden beds at Cranbourne, complete with an array of nectar feeding Australian birds making guest appearances. 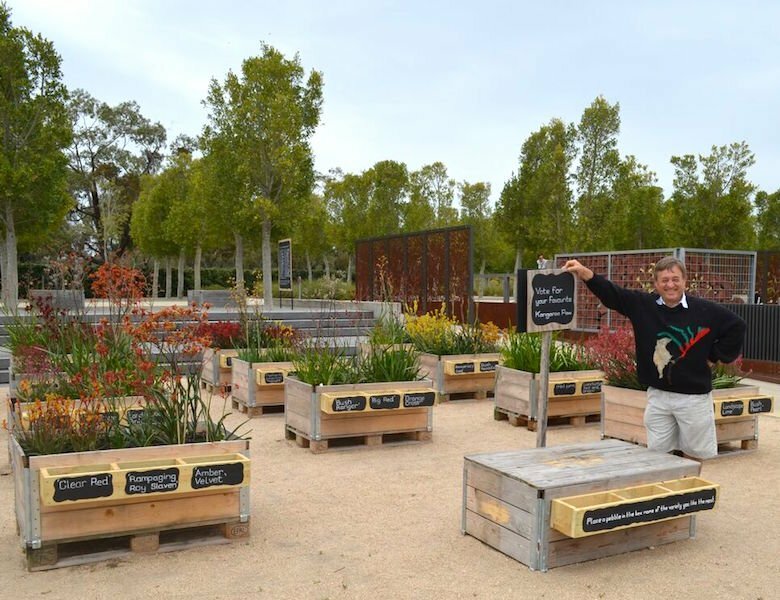 All in all, the inaugural Kangaroo Paw Celebration is an exciting event for lovers of Australian plants with the apparent promise of it becoming an annual event on the Cranbourne Gardens calendar. 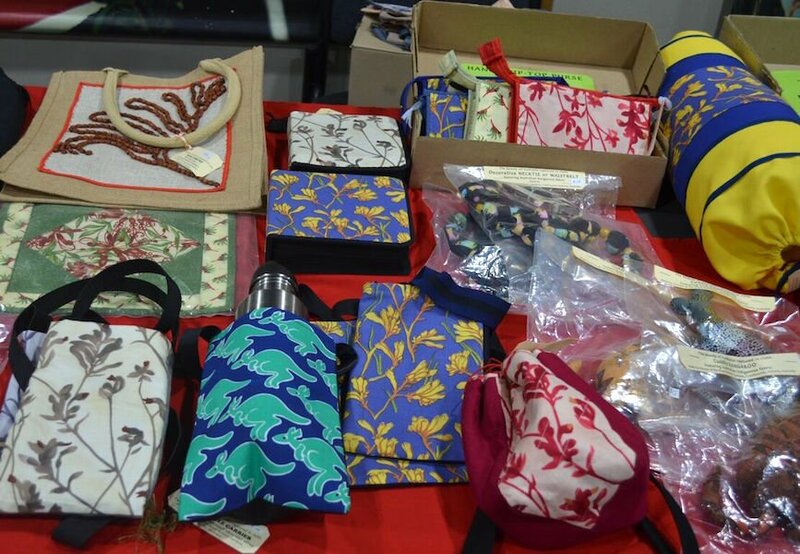 Kangaroo Paw Exhibition A celebration of the species through the eyes of artists: art, basketry, fabrics and more. Lovely! I’ve been reluctant to plant these in my garden, but I think you’ve convinced me! Where can I buy your ‘Landscape Violet’? Thanks Angus – you’re awesome!